Do you remember the first time you attended summer camp? My earliest memories of summer camp are walking through Camp Brown with my Boy Scout troop, my trusty, dad-made walking stick and leaky canteen. I remember constantly running around and wanting to participate in every activity available. Leather lanyards were the “thing” to make at camp – I think I made 4 or 5 of them. The camp director threw a giant ice block in the pool during the opening ceremonies, which my kid brain thought “Nope! That pool is going to be too cold now!” – I eventually jumped in. -Camp can be a very special and memorial experience for youth. This year, Kristina and I volunteered at the “Express Yourself Camp” located at Camp Tongawood in Tonganoxie, KS. Express Yourself Camp is a 2-day day camp sponsored by St. Luke’s Hospital in partnership with the Girl Scouts of the USA. 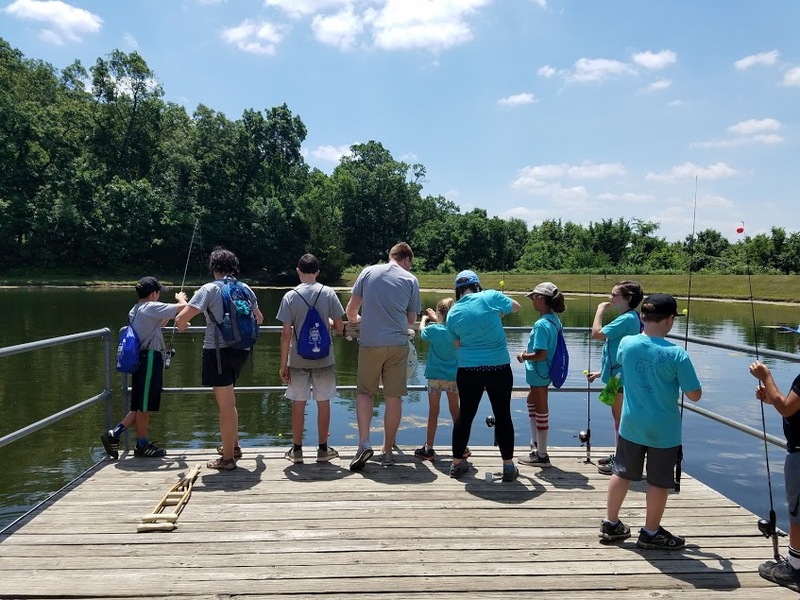 The camp is designed to provide a safe place for youth who have recently experienced a tragic loss to connect with youth who have had similar experiences, and build caring relationships with youth development professionals. Each day consisted of archery, hiking, fishing, art, zip-lining, and even an escape room. The camp concluded with a visit from the Kona Ice truck and everyone was able to enjoy their own frosty treat before saying goodbyes! This was a unique experience because it wasn’t like a normal summer camp. The youth that attended this camp recently experienced some kind of emotional trauma which created a very special, yet slightly unstable environment. All of the counselors were youth development professionals that have experience in providing social emotional support to youth. By bringing together a group of high-quality, youth development professionals, we we’re able to provide a fun and engaging experience for these youth during a time when fun and engaging was needed. Since my current position doesn’t allow me to work on the front line every day, I try to take as many opportunities I can to get back in the “trenches”. It always helps remind me why I was called to this field of work. If you’re in a position like me, where you aren’t frequently working on the front lines, I would highly recommend looking into volunteering for an afterschool/summer program. It’s the best way to reassure you of the working that you’re doing and why you need to be doing it. Did you make some great memories in summer programs this year? Share them on social media with the Kansas Enrichment Network!